As soon as I cast off my last Hanne mitten, I wanted to make the pattern into hat. Actually, I want to turn it into multiple hats, because I can’t stop thinking of different variations and colorways that I want to experiment with. The Hanne mittens are written for Berroco Ultra Alpaca or Berroco Ultra Alpaca Tonal, either yarn also makes a delicious hat that will keep you warm even on the coldest days of winter. You could easily substitute Berroco Vintage, which works up at the same gauge and is an easy-care machine washable yarn. If you love the look of the tonal yarn but are concerned about skin sensitivity, consider Berroco Artisan, which is a super soft wool/silk blend. I wanted to experiment with making this hat to fit a child. so I used Vintage DK for a finer gauge and a smaller hat. 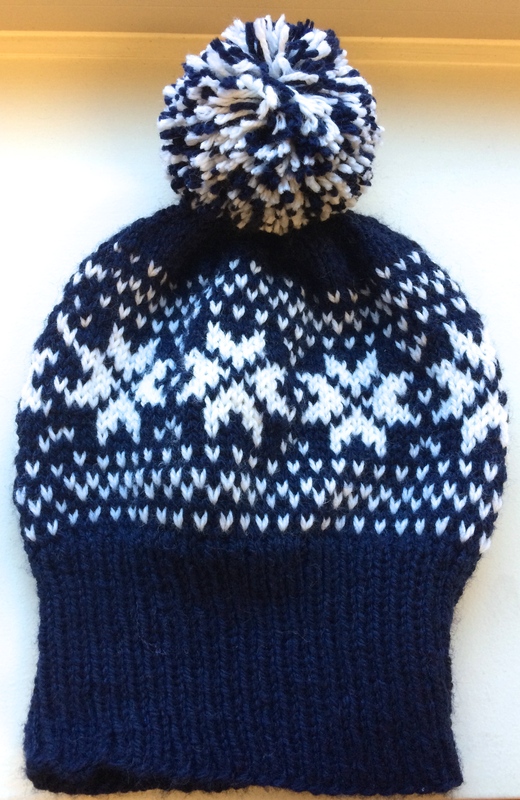 To work this pattern as a hat, I doubled the mitten stitches for a total of 96 stitches. If you are making your hat for an adult consider changing your needles – a U.S. 6 needle should produce a gauge of 5-5.25 sts/inch in a worsted weight yarn and will make a 19 1/4-18 1/2″ hat, which is about average for a fitted adult hat. At a gauge of 5.5 sts/inch, the Vintage DK will give me a 16 1/2″ hat- perfect for a 3-6 year old. Next, consider the ribbing. Since I am knitting for a kid, I opted to sub in a classic 1×1 rib in just 1 color that can be knit long and cuffed. The extra length will keep ears warm and extend the fit over several years of growing. I simplified the pattern to offset the added length in the ribbing, working through round 25 then continuing with the MC only for the crown shaping. You could also keep the decorative corrugated rib and continue working the pattern as charted for the mitten, but skip the Hanne pattern chart rounds 21-23 and 43-50 to offset the length. When you reach the end of the chart, work 1 round of k2 together across all the remaining stitches- you will have 9 stitches remaining. As you begin to work the decreases for the crown, switch to DPNs or use 2 circular needles when the stitches no longer fit comfortably around the 16″ needle. After all the decreases have been completed, break the yarn, leaving an 8” long tail. Thread the tail into a tapestry needle and draw through all sts on needles. Pull up tightly and run the needle back around through the stitches a few more times to secure. Weave in your ends and block as needed for your yarn. Next article Emily Explains: My yarn broke and there is a hole in my knitting… help!